Earth Day 2017 is almost here. This year we’re celebrating by telling the story of how Martha’s Vineyard, a historic American island, is leading the way toward a clean energy future. By embracing renewables such as solar and wind, the island’s residents are creating a sustainable living community. South Mountain Company, a local employee-owned company, has been instrumental in the adoption of renewable energy on the island and is responsible for approximately half of the more than 500 solar installations on Martha’s Vineyard. “We’ve been integrating renewables since the 1970s, and it has always been us pushing the technology. We can tell we’re making progress because now people are pushing us,” said John Abrams, founder, CEO and president of South Mountain Company. A small portion of Martha’s Vineyard’s renewables mix comes from onshore wind. The community is planning to develop a large offshore wind installation in the next four to eight years, which along with ongoing solar developments, will significantly grow the island’s total renewables portfolio. Watch this video to see how South Mountain seamlessly designs solar installations that complement the island's beauty. The island is connected to the mainland’s conventional energy grid by four separate underwater cables totaling 62 megawatts of electric capacity. For roughly a decade, island businesses and homeowners, as well as several of the six island towns, have incorporated approximately eight megawatts of locally produced renewable energy into their lives. “Having local renewable energy generation exceed 10 percent of the mainland supply feels good, and the impact is actually much greater than that especially given that nationally renewables make up less than 1 percent of the mix,” said Rob Meyers, Energy Services Manager at South Mountain Company. Generating and delivering electricity in the region is about 30 percent efficient, meaning that roughly 70 percent of the electricity is lost in the process. “Each kilowatt we produce on the island offsets three kilowatt hours of fossil-fuel generated electricity from the mainland that’s transmitted via the underwater cables,” Meyers said. Because locally produced electricity doesn't have to be transmitted long distances, it's a much more efficient energy source. 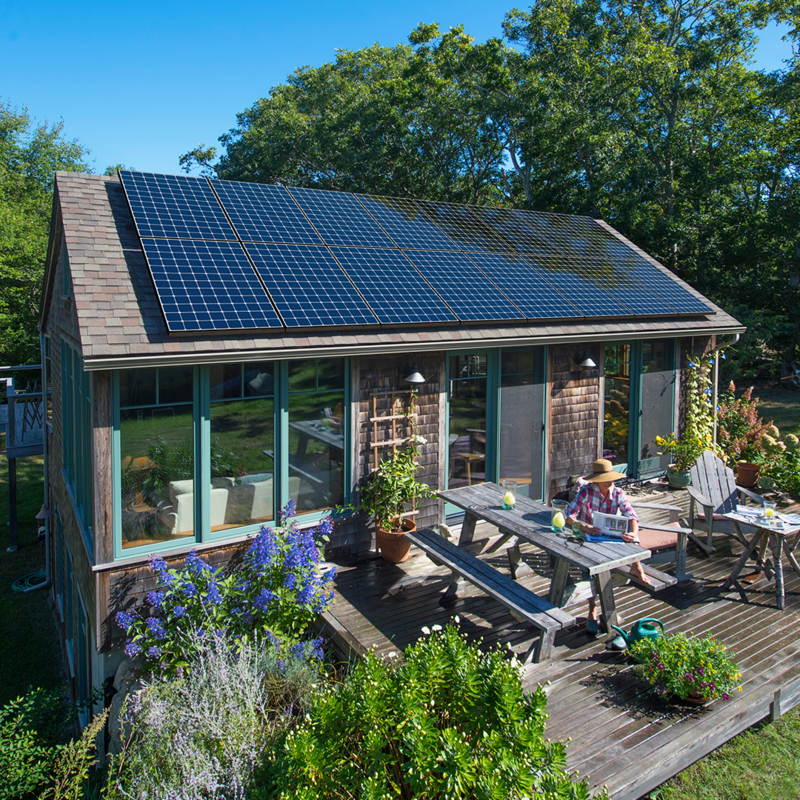 Solar dominates the renewable energy mix on Martha’s Vineyard, and SMC uses SunPower® solar almost exclusively for its residential, commercial, and institutional projects. “We’re fans of SunPower technology because we know when we put a panel on a project it’s the highest performing panel in the industry,” Meyers said. Formed in 2009, Vineyard Power is the island’s renewable energy cooperative, and SMC has collaborated with the co-op since its inception. Their collaboration has led to several innovative community solar installations, including repurposing two of the island’s capped landfills, maximizing space at a century-old, family-owned supermarket and empowering the local Boys and Girls Club with an annual solar energy offset of nearly 100 percent. The path to a renewable energy future is challenging and having the support of the local community is essential to success. “We need to enable planning boards and municipal government to help clean energy, not hinder it. The folks doing that important work in a small community are largely volunteering. It is important to make ourselves available to them as a resource. The local citizens’ clean energy co-op has been a very strong force in that process,” Abrams said. With its pristine beaches and mild summer weather, Martha’s Vineyard is a global vacation destination. Each year tourists flock to the island to take in the sights, the sea and the culture. Earth Day is April 22. Celebrate this year by drawing inspiration from the Martha’s Vineyard story in this three-part blog and video series. Next week we’ll take a look inside the integrated architecture, engineering and building approach of South Mountain Company. We’ll learn how SMC leverages SunPower technology to craft powerful solar installations that blend with both historic architecture and modern design. In the third post, we’ll explore SMC’s commercial and municipal projects, including a net zero affordable housing neighborhood and a plan to potentially use renewables to power the local transportation system.